Tunis. January 2018. Ines Mahmoud. All rights reserved.For the past three weeks the streets of Tunisia have been echoing screams for freedom, dignity and justice. These same calls led to the overthrow of Ben Ali’s dictatorship seven years ago. Fed up with newly imposed austerity measures, the people are taking their anger to the streets to send a clear message to the government. A big national protest is now being organised for January 26. 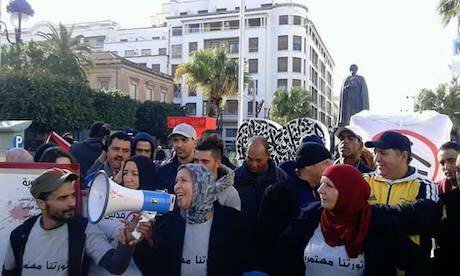 The Tunisian working class’ fight against poverty, corruption and unemployment is ever more present. A new campaign under the slogan of “Fech nstenew?” (what are we waiting for?) is going viral against the neoliberal governments’ policies. The demands are a reduction in the prices of basic goods, an end to the privatization of public institutions, free education, social and health care for the unemployed as well as social welfare and housing for low-income families. In its first weeks, the movement reached a nation-wide mobilization with protests erupting all over the country. However, they have been met with harsh repression; nearly 800 protestors and activists have been arrested with one protestor having been killed. This new Finance Act was put into effect on the 1 January 2018, entailing price increases of basic goods such as food, electricity and gas, a reduction in public sector employment as well as VAT increases. Tunisia is often praised as the shining example of “Arab revolutions”, however, not much has changed since 2011, especially on an economic level. The unemployment rate remains at the same levels it was before the revolution (15.2 percent for men and 22.8 percent for women). Furthermore, the country’s already weak economy, which depends heavily on tourism, was further weakened after the terrorist attacks of 2015. Rising inflation and depreciation of the Tunisian dinar hit a record low on 8 January 2018, trading at 3.011 against the Euro. To pander economic growth, the neoliberal government, led by the parties of Islamist Ennahda and its counterpart Nidaa Tounes – which consist mainly of the political elites of Ben Ali’s dictatorship – are relying heavily on foreign investments and privatization. In December 2017, when Tunisia was put on a blacklist of seventeen jurisdictions deemed to be tax havens by the European Union, the government decided to fully adhere to the IMF’s conditions of implementing drastic austerity measures in order to receive the second instalment of a 2.9 billion dollar loan that was approved in 2016. Consequently, the European Union recently proposed taking Tunisia off the blacklist. Warda Atig, student and activist from the student union UGET and founding member of the “Fech Nstenew?” movement says the date for the launch of the campaign was chosen due to its symbolical political meaning; thirty-four years ago, on 3 January 1984 bread-riots peaked across Tunisia. 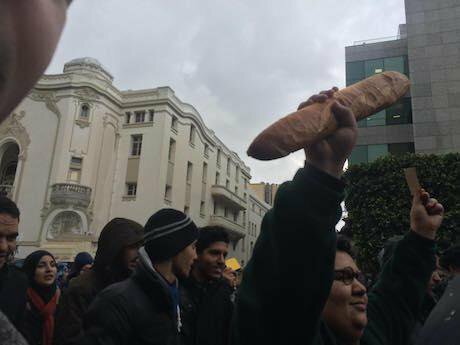 Even then, the increase in price of bread and other basic goods was the result of austerity measures caused by the conditionality of an IMF loan taken up by the government of ex-dictator Habib Bourgiba. “Today we are still paying for the IMF debts of Ben Ali” she says. In her opinion, the Tunisian working class did not benefit from the IMF loan, on the contrary, “the social condition has worsened,” Atig added. After the release of the statement, Facebook groups were founded through which people started organizing protests across the country. The backlash against the campaign however happened simultaneously. “When our activists started distributing the statement in their regions and spraying graffiti with our slogan on the streets, they were exposed to a great deal of police harassment. There were more than fifty arrests in less than 48 hours,” reports Wael Naouar from “Fech Nstenew”. Tunis. January 2018. Ines Mahmoud. 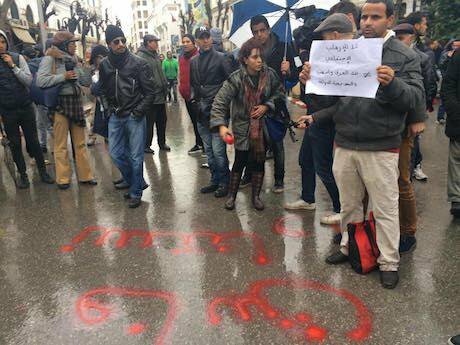 All rights reserved.On January 4, protests broke out in Kairouan as well as Tunis, Sfax, Ben Arous and Sousse. Ever since, they have extended to the regions of Kasserine, Ariana, Manouba, Sfax, Ben Arous, El Kef, Thala, Sidi Bouzid, Kairouan, Gafsa, Gabes, Nabeul, El Kef, Kebili, Siliana Monastir, Mahdia and Beja. In regions most affected by poverty such as Sidi Bouzid, protests have been the biggest. Many of the protests resulted in confrontations with the police; middle class cars were destroyed and supermarkets were broken into. From then on, protests were met with police violence, teargas and numerous arrests. On the night of January 8 in the city of Tebourba, the protestor Khomsi Yafrni was killed. This is when the situation escalated. According to the government, he died from respiration problems triggered by tear gas. Images circulating on social media however show how Khomsi was run over by a police car. The autopsy report remains inaccessible to the public. 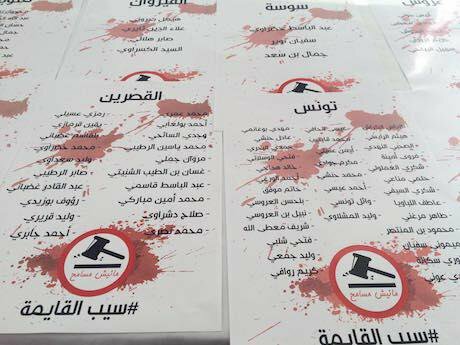 As the news about the first martyr spread, activists from “Fech Nstenew” and “Manich Msamah” called for a demonstration in the capital the following day. “Manich Msamah” is an anti-corruption movement that is fighting against the reconciliation bill that granted amnesty to bureaucrats who systematically benefited from corruption under the dictatorship of Ben Ali. Government officials as well as mainstream media were quick to spread outrage against the revolts that occurred on the night of January 8. The following day, Prime Minister Youssef Chahed declared that “what happened yesterday was not a protest, but sabotage and assault.” The right to protest would be guaranteed by the law, however “in democratic countries” people should not demonstrate during the night. In a public statement by Noureddine Taboubi, secretary general of the Tunisian labour union UGTT, condemned the destruction of property harshly. However, political parties of the left such as the Popular Front and Attayar, published statements, stating their support for the political campaign, but calling for protestors to refrain from acts of violence. Besides mobilization on the streets, “Fech Nstenew” is focussing on a media campaign. Next to making their demands heard in alternative media, they are defending their positions against those of the government in TV-confrontations on TV show. Tunis. January 2018. Ines Mahmoud. All rights reserved.Hamza Abidi, who recently defended the positions of “Fech Nstenew” in a televised debate with Mehdi Ben Gharbia, stresses the importance of these public confrontations with the government on national TV. What is different to the initial situation of the uprising 2011, is that on a political level, Tunisians today have more democratic rights: “Today, we can appear on TV, express our opinion, protest on the streets and hold political meetings,” Wards adds. The activists however see the attempt of a criminalization of the protesters in the overt focus on nightly unrest and vandalism, overshadowing peaceful demonstrations during the day. Wael Naouar, activist and founding member of “Fech Nstenew” sees a continuation of the strategies to discredit the revolution used by the dictatorship of Ben Ali: “based on a few incidents, the government is trying to criminalize the protests.” “Every campaign organized by young people in Tunisia is continuously being confronted with false accusations of destruction and vandalism,” adds Hamza Abidi. On January 10, after protestors had burned down a security building in Thala, near the border to Algeria, the government deployed the army in Kebeli, Bizert and Sousse to protect government buildings. Violent clashes as well as a number of arrests ensued and continued through the night. Among them was Ahmed Sassi, a philosophy graduate and well-known activist from the student union UGET. 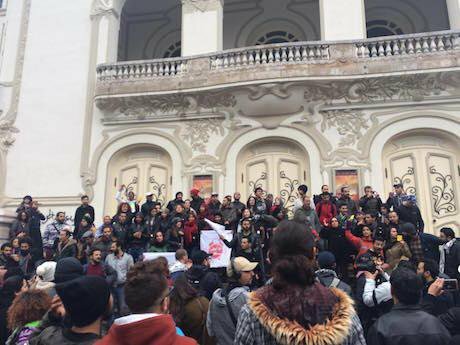 After his arrested in front of his home, activists from “Fech Nstenew” campaigned for his release and organised a protest in front of the court in Tunis where he was facing charges of “rioting.” Luckily, he was released two days later. Over the past few years, the Tunisian government has used the rhetoric of “economic rationale” to pass laws such as the amnesty bill, arguing that it would strengthen the national economy and enable further foreign investments. However, recent protests show that this argument is not enough anymore and does not satisfy the masses. These recent mobilizations show that the impact of political organizing goes beyond parliamentary parties. They are definitely not to be underestimated. “Manich Msamah represents a continuity of social movements in Tunisia. There have been movements before us and there will be many after us,” says Heythem Guesmi, an activist of the movement. “Manich Msamah managed to bring 15,000 people to the streets. We are accumulating activist experience, getting to know each other, developing ideas and strategies and growing together,” adds Hamza Abidi. Tunis. January 2018. Ines Mahmoud. All rights reserved.The movement has now started collecting information on the hundreds of protestors the government has recently imprisoned. 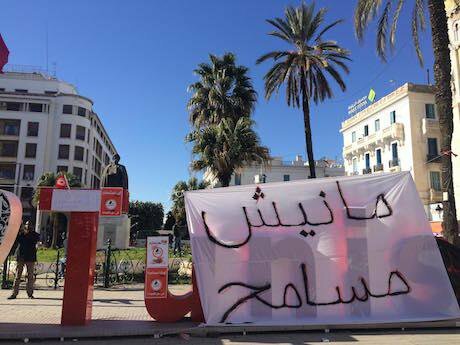 They are now preparing a prisoner’s campaign with the movement “Hassibehom” (“hold them to accouont”), which has been opposing the police law in Tunisia since 2015. As of today, the number of political prisoners has exceeded 800 young women and men between the ages of 15 and 25. The activists agree that the goal of the protests is the fulfilment of socio-economic demands outlined in their initial statement. One would be the government being open to dialogue with the people and revising the new austerity laws. The second would be the open oppression of protests with curfews and further arrests, which could seriously hinder the democratic path of the country. The third would be the government playing deaf, pretending not to hear peoples demands, which would lead to people demanding its abolishment anew.